They came out of the oven looking so pretty. But we were in a rush to get out the door to grab some lunch for my sister and brother-in-law who were up at the hospital enjoying their new baby. So I tossed the warm, delicious smelling rolls still in the pan onto a wire rack to let them cool, and we left. That was mistake #2. Let me back up a minute. Adam and I had been in New Jersey for about a day and a half at this point, watching our nephew while my sister was in the hospital having their second child. I had this grandiose idea that I was going to make them lots and lots of freezer meals that they could pull out whenever they were too tired to cook (which I expected to be the first few days, or weeks). After getting in very late Thursday night, we got up to a very loud alarm clock ("Uncle Adnam! Get UP! "), ate some breakfast, then I hit the grocery store. I whipped up two batches of lasagna without blinking an eye. The marinara? Easy. Then we got "the call", or rather, picture mail. "He's here!" At this point our nephew was still down for his afternoon nap so we decided it would be best if we went up to the hospital after dinner. As the timetable had been sped up a few hours faster than expected, I hurriedly made a double batch of some skinny chimis which we ended up eating half of for dinner. Due to some medical issues we weren't able to see the new little guy that first night, which was kind of disappointing. So we trucked back home and prepared to head back the next day. 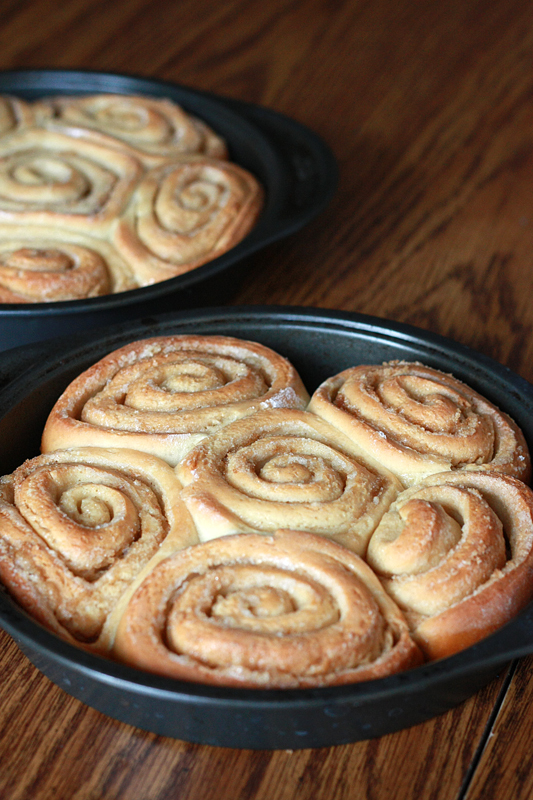 The next day came far too early, and I think my lack of sleep clouded my judgement that it would be a good idea (and I would have plenty of time) to make some Gooey Sticky Cinnamon Buns to take to my sister. The dough was easy enough to put together and rolled out without a hitch. Then I forgot the cinnamon. And had no.idea. I merrily rolled up the dough with the butter and sugar, sliced it and sent it into the oven. After arriving back from the hospital the second time, I immediately went over to check on the rolls. Hard.as.a.rock. Not only were the rolls hard, the melted sugar had seeped underneath my wax paper lining, and had glued the rolls to the bottom of the pan. Not what I wanted to deal with. After prying one roll out I was able to finagle the remaining rolls out in one piece. Maybe they weren't as bad as I thought? Maybe just a quick reheat would work? Then I tried it. Something was missing. I hadn't put the icing on yet, but they still weren't screaming gooey and sticky to me. As I was taking the first pictures it hit me. No cinnamon. Well, you can't exactly call them cinnamon rolls without the main ingredient, and they definitely could have used it for a flavor boost. 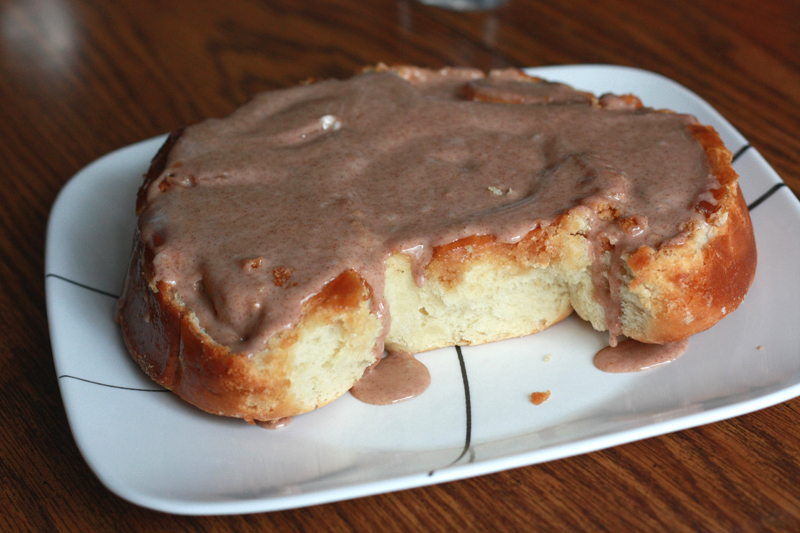 On a last minute whim I decided to try to make a cinnamon icing to see if I could cover my mistake. Sometimes, there's just nothing you can do but to start over. Which I didn't. I still had 2 batches of Potato Soup and a baked pasta dish to make yet. Sigh, such is life. I fully intend on making these again. Sometime in the near future, as I never did get my gooey cinnamon roll fix. LOL. I couldn't help but smile as I read this. I know firsthand the loveliness of kitchen blunders (i.e. Panettone), so I feel your pain. :p They certainly looked great, though!! Bless your heart. It sounds like you have been working up a storm, but I'm sure your sister is very grateful to have you there! Oops! We've all done something like that before. Your family will appreciate all of your work and help. Been there done that. We all have kitchen disasters no matter how experienced we are. Keeps us humble I suppose. The most important thing is you really tried to help them out which is so thoughtful! Great post - I'm sure they will turn out amazing the next time around! Bless your heart! 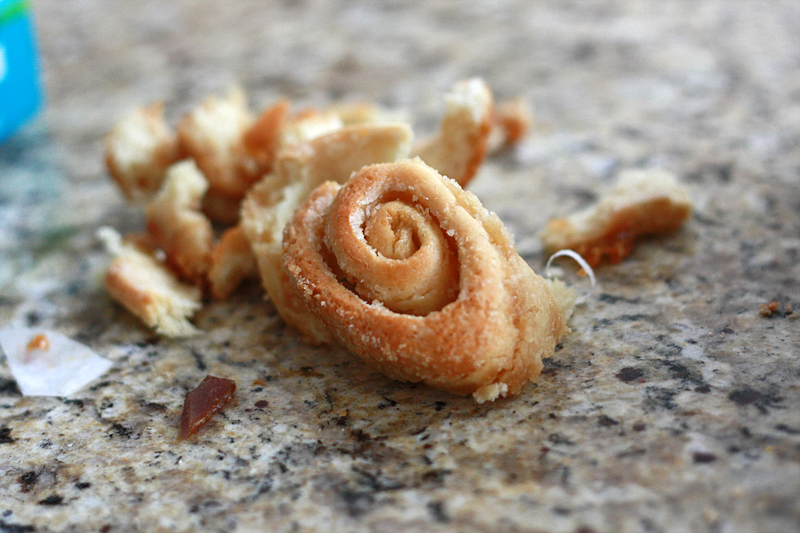 My cinnamon ran out of my rolls too, they were for my dad's friends - they didn't care one bit...but I was sure mad! Next time - they'll be perfect! Ahhhh.... this post made me smile! I do things like that all the time and my husband just laughs at me. Congratulations on the new little guy, hope you can post a pic! You are a good person to make all those things, I know how much they will be appreciated! Oh no!! This post gave me quite the chuckle this morning. I knew right away what happen. It happens! well you certainly had the best intentions, but your thoughts were with your sister, completely understandable. Your rolls look delicious as I am sure everything you made for her was! Congrats on your top 9 today. I was waiting for this story! Yikes! It sounds like you had a lot going on! Overstimulation and rushing don't make for good food. I know... I was late preparing food for a dinner gathering a couple of days ago. Rushing around, I turned the oven "off" and by off, I mean to BROIL! Yup. Food. Burned. URG! Looking forward to see new pictures of your nephew! Too funny! Thanks for sharing your real life as we all tend to do this at some point or another. The other day I was on my like 8th or 9th round of bread from my starter and about 45 min. in to my bread baking I found my eggs laying on the counter that were supposed to be in my mix, in my loaf pans in the oven!!! Ahhh.. needless to say they didn't rise, but still tasted good!!! Well, even if you want to try these again, the first round looks amazing! Well done on top 9! Great story, even if they didn't turn out as you wished. That's what you get for being so thoughtful and kind. Enjoy these delicious family moments. It always makes me happy to hear of other people's kitchen mistakes because it helps me not feel so bad about my own. Last week I tried to make lemon sherbert with rosemary and honey that was a terrible fail. Completely inedible. I thought it sounded like a good idea but I was horribly wrong. We just have to keep on trying and learning! Thanks for sharing! That's happened to me before, too. I couldn't help but laugh when this post made me think about my own mistakes. They do look really good, though! Want Some Red Velvet Whoopie Pies?